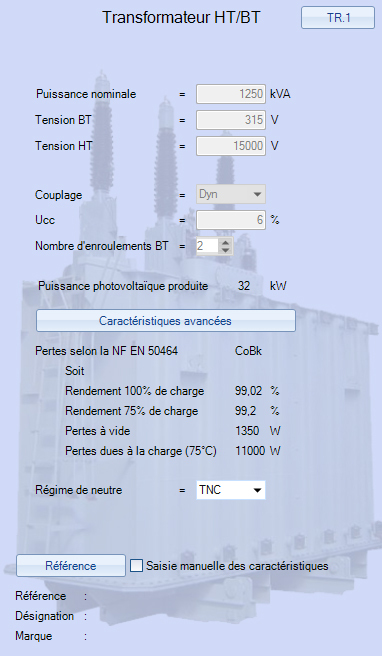 The base version of archelios Calc™ is limited to a direct connection to the public network of supply.In other words, a three-phase network 230/400 V, TT grounding system, under a maximum power de 250 kVA. The HV/LV module, intended to the conception of installations of high power, offers a HV/LW transformer access, without limitation linked with the supply network. The produced power and the voltage of the three-phase network are only limited by the choice of the transformer. The AC part of the installation can be conceived under any neutral point. The module is not only about adding a transformer. All AC equipment is impacted by the functionalities of the HV/LV module. With this High Voltage module, the user chooses at the launch of archelios Calc™ the type of installation to design: LV subscription or HV/LV transformer. Once the HV/LV Transformer box ticked, the user is guided throughout the technical characteristics of the transformer. The entered information are included in the same way in the AC part of the calculation report. The High Voltage module requires an archelios Calc™ license to operate. This module is delivered on the Internet, needing no installing or downloading: the availability of the module is immediate within 48 hours, simply by reactivating your archelios Calc™ license. The subscription warrant applies in the same way on the license and on the module. Order the HV module now!